Two (2) TN $10 Bank Blue Seal National Currency bank notes, depicting the portrait of President William McKinley. 1st item: $10 "Plain Back" bank note dated 1902 from The Fourth and First National Bank of Nashville, Tennessee. Third Issue. Serial # 181494/ pp L. CH # 1669. FR # 628. Napier/McClung signatures. 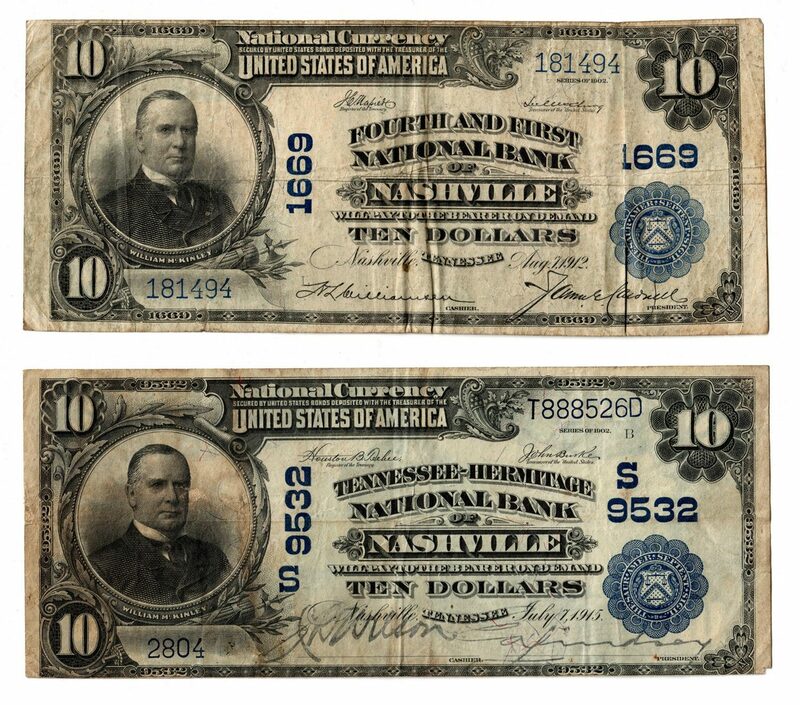 2nd item: $10 "Plain Back" bank note dated 1902 from The Tennessee-Hermitage National Bank of Nashville, Tennessee. Third Issue. Serial # T8888526D/2804 pp B. CH # 9532. FR # 632. Teehee/Burke signatures. Provenance: the collection of the late James A. Newman (Nashville, TN, 1892-1964). CONDITION: 1st-2nd items: Good/Very Good condition.